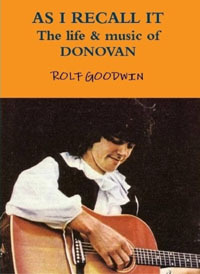 Description: As I Recall It: the Life & Music of Donovan is a revision of Tom Grierson's book Donovan: Truth Is Molten, re-edited by Rolf Goodwin. Seven years after the release of Grierson's book in 2002, it was clear it had to be reviewed, especially when in 2005 Donovan released his autobiography. This is a must have for every person who consider themself a Donofan.